So a couple of weeks back I performed the roles of the animal welfare officer, and veterinarian on duty for the duration of the Samsung “Charge” TVC, shot on Bethells Beach. We were required mainly for first aid and to monitor and report on animal welfare during the week long shoot. I was massively pleased with the level of animal health, the care and handling on set was of an exemplary level. The production company, Big Pictures Ltd, had put a lot of thought into choosing the best trainers for the job and constantly checked in with me each day as to the wellbeing of all the animals on set. The team of 13 horses used in 15 different on camera roles were the best trained and behaved I have ever witnessed. They were well watered, sheltered and fed. My particular Favourite was a huge black Friesian Stallion cast as an eleven war horse. A large number of excellent wranglers were provided and all riders used were hand-picked, experienced horse stunt people. The horses were well controlled without any resort to harsh measures. Wayne McCormack exhibited an incredible level of skill in the training, preparation and control of his equine team. It was clearly apparent he cares greatly for the welfare of his horses, and of the people working both in his team, and around them on set. 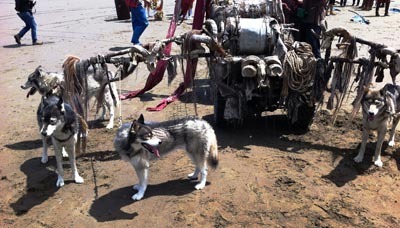 The “wolf” team consisted of 6 Huskies. This professional sled team, trained by James Delaney, was similarly well prepared, expertly cared for and handled with great skill and care. James and his team put great thought and effort into keeping his dogs safe, calm and under control, and into turning up prepped for their roles. The animals were all happy, the shoot was amazing and we all got a great tan out on the black sand of Bethells, like I said, it’s a tough job but someone had to do it.